This medal was awarded to all members of the armed forces, 1914-18, in recognition of their ardous services in bringing the war to a successful conclusion. Battle of the Somme (July-November 1916) was fought between British and German forces in Northern France. On 24th June 1916 the British started a massive bambardment. British troops advanced from their trenches with the loss of 60,000 men, 19,000 of them dead. The Battle of the Somme ended on 18th November with the allies having gained only a few kilometres. This reproduction British War Medal is made from lead-free pewter. It is supplied on a blue, black, white and gold ribbon attached to a card with an image of British troops ready to charge 'over the top' on the front and historical information on the reverse. The Vitruvian Man in gold plated pewter supplied on a gold chain. The information card gives a brief outline of Da Vinci's life as an artist. A pewter World War I Bi-Plane mounted on a quality key chain. Pewter Lancaster supplied on a waxed cord. The information on the reverse of the card describes the Lancaster and when it was used. A full-size Victory Medal supplied with ribbon in a clear medal wallet with colour header card. 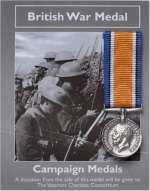 The information on the card describes how and when the medal was awarded.